The Cayman Island Turtle Farm offers an Adventure Tour that includes: Turtle Lagoon, Predator Reef, Caribbean Free Flight Aviary, and Breaker’s Lagoon. All in one location, you can swim in a lagoon with Green Sea Turtles, watch sharks and other predators through the underwater or dry view panels, see and feed Caribbean birds, play in the largest swimming pool on Cayman, rush down a two loop water slide, and stroll along a beautiful nature trail. The original farm was created to breed Green Sea Turtles for their meat, a traditional Caymanian dish. It continues that service today, supplying all turtle meat sold on the island. The turtles remain a central attraction, and you can tour the research–breeding facility with thousands of turtles in various stages of growth, some up to 600 pounds and more than 70 years old. There are four areas, three aquatic and one dry, covering 23 acres. Upon entering the park, we were greeted by The Green’s Breeding Pond where most of the park’s breeder turtles reside. Massive turtles, larger than any I’ve seen before, were swimming in the sun and occasionally surfacing to take a breath of air or eat food that was on the surface of the water. There seemed to be dozens and maybe even hundreds. While they had their own space, I wondered about the inhumanity of it all. It is a farm and they are breeding the turtles for their meat, which isn’t necessarily the problem. I do eat meat and I’m certain it isn’t always “processed” in the most humane ways but watching the turtles swim around and over each other, devouring any food thrown into the water, made me stop and think about the process. We held yearling turtles and I cooed over their adorable little fins flapping in my hands. I was grateful for the encounter and surprised at how quickly they calmed down when I rubbed their neck. Again, though, a sadness entered my mind when I thought about their fate. I was conflicted; both grateful and saddened by the experience, so we ventured to the Turtle Lagoon for an uplifting encounter. 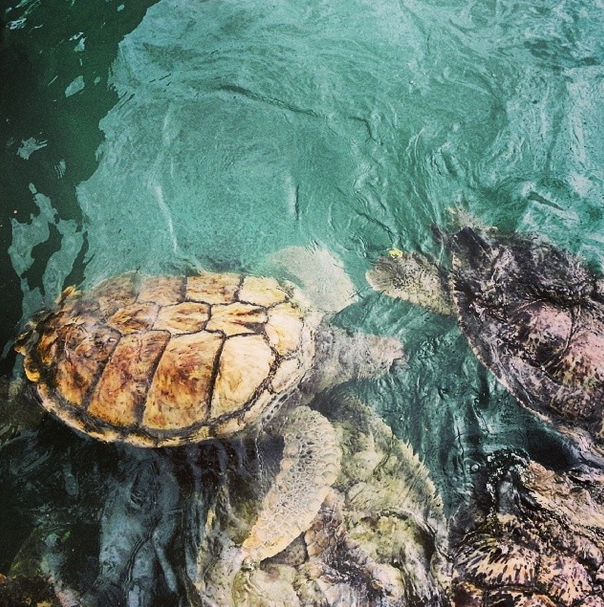 At the Turtle Lagoon, we were able to snorkel with sea turtles and various reef fish. I’ve finally become comfortable with being surrounded by marine life and it’s a pleasure to be in a new, colorful environment. There was one corner of the lagoon where dozens of fish schooled together. While I did feel more intimidated, I didn’t panic or swim away. I relaxed my body and floated over them calmly. They continued swimming freely, without fear. Every time I’m in a situation like this, I become more and more comfortable in their world. I might even be ready for sharks, but I’ll cross that bridge when I get there. Next, we made our way over to the swimming pool to take a spin on the Turtle Twister water slide. It was a cooler day with high winds so one trip down the slide was plenty for us before running for the hot showers. The Cayman Turtle Farm is continuously sharing its research, they sponsor an annual turtle release to help replenish the wild population of green sea turtles, and the programs offered to tourists are undoubtedly educational, yet I’m torn between all of the good that they do and the breeding grounds where the turtles are kept. Life on the Cayman Turtle Farm is obviously a bleak contrast from how sea turtles live in the wild. Do the benefits of facilities like The Cayman Turtle Farm outweigh the damages? Should we be thinking more critically about our forms of entertainment?